Over the last week, I have been investigating different educational technology tools that can be used in the classroom. I found that I like Powtoon the best for another form of media to present with. 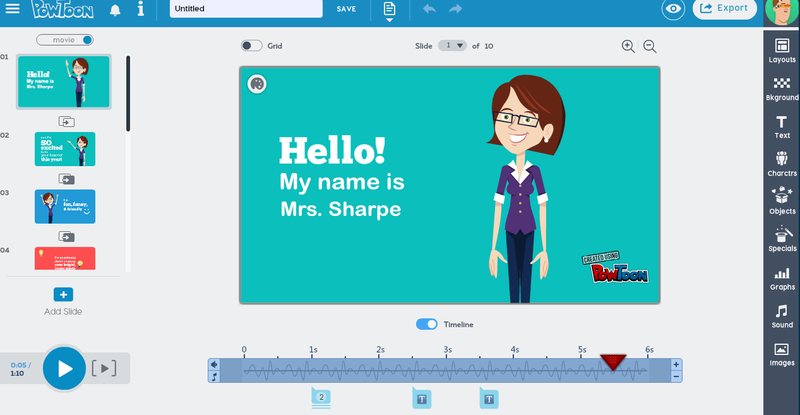 There are many different presentation platforms that teachers and student can use the internet, my usual presentation tools are Prezi, GoogleSlides, and Powerpoint but Powtoon is different in that the user can animate it. 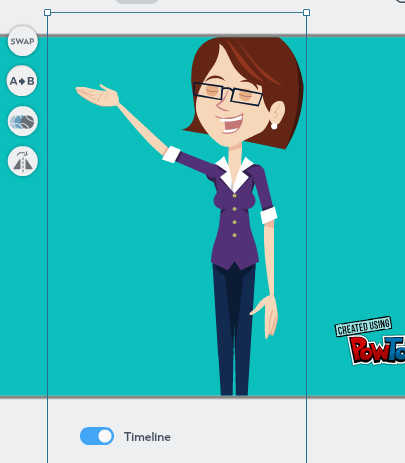 Powtoon is an easy tool to use, There are templates to pick from or you can create your own story. This tool looks like google slides and powerpoint when you are creating it but you can add and do so much more. The picture above shows the opening screen for the template classed awesomeness. On the left-hand side of the computer screen, there are the different slides. Along the bottom where the where are a slide that shows the seconds on the top and the animations along the bottom this helps for when you want to have pictures transition from spot to spot or when you want to add an animation in at a certain time. On the right-hand side is the different tools you can use to create the presentation. The different tools include layouts, backgrounds, texts, characters, objects, specials, graphs, sound, and images. I like that in each different category there is several different images or animations that you can pick from. The downside is that most of the images and animations are only available if you subscribe to Powtoon. Above shows how to move the character around the slide but pressing the AB button. You can also mirror the character. The baseball button allows for the user to select if they want the character animated and for how long. Lastly, the swap button can be used to switch our characters. From here you can drag the slide on the time bar to how long you want to transition the character. From here is the user can put in the text or other objects. Then all the user needs to do is export. You can pick many different media channels to export to. I put it on my youtube channel. There are lots to learn in Powtoon, and I think it would be a great tool to differentiate presentations in the classroom. However, like all great technology tool, the teacher needs to play with it first before they introduce it into the classroom. Also, I would teach my students how to use it slowly before expecting a presentation to be completed on it. Due to the many different manipulations that the user can do. If you have students that are to shy to speak in front of the class there is an option to add sound. Which is great! I rate this tool 3/5 seals because there is almost too much the user can do and it is a little tricky to learn to use. However, there is a useful tutorial to watch in order to learn about this ed. tech tool. Here is my creation, well I started it anyway. It was overwhelming at first but once I started to play with it, it was fun. I think it would be great for an adaptation for students that cannot present in front of their class.